Late 4th Bengal European Regiment. Lieutenant (now Captain) George Vincent Fosbery, Date of Act of Bravery, October 30th, 1863. 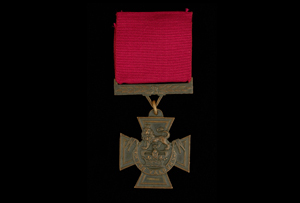 For the daring and gallant manner in which, on the 30th of October, 1863, acting as a Volunteer at the time, he led a party of his Regiment to re-capture the Crag Picquet, after its Garrison had been driven in by the Enemy, on which occasion sixty of them were killed in desperate hand to hand fighting. Subsequently, Lieutenant-Colonel Keyes being wounded, Lieutenant Fosbery assembled a party with which he pursued the routed enemy in the direction of the Lalloo ridge, inflicting on them further loss and confirming possession of the post.